Indian Star batsman Rohit Sharma has raised many eyebrows after he liked a tweet by a Twitter user who pointed out how the BCCI had different rules for different players. He also questioned the BCCI's dual behaviour over WAGs. India cricket fans lashed out at BCCI for posting a picture of Anushka Sharma with Indian cricket team. However BCCI has now broken silence over the controversy saying everything was within the protocols. According to the reports of Times Now, “This is the norm wherever the team travels. The High Commission invites the players with their relatives and it is eventually the decision of the individuals. Even in London, the players were invited along with their partners. There has been no breach of any protocol,” a source told the newspaper. 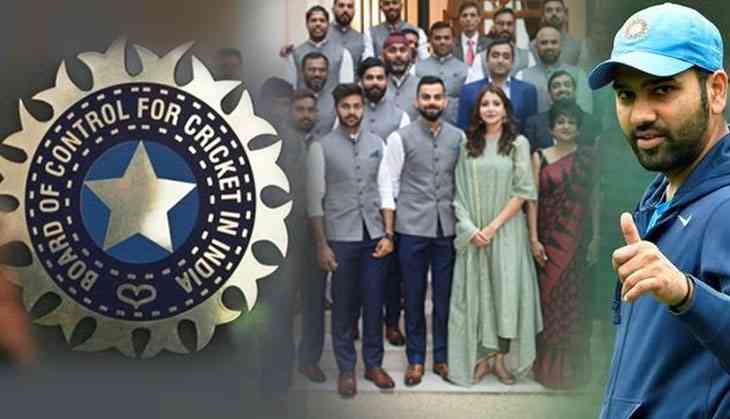 BCCI posted a picture of gathering at the Indian High Commission in London of the entire cricket squad that played under the leadership of captain Virat Kohli. Questioning BCCI’s dual standard over WAGs a Twitter user wrote, “@ImRo45 void is filled up by @AnushkaSharma I believe WAG’s are not allowed till 3rd test. Different rules for different players!.” And the tweet was liked by ‘hitman’ Rohit Sharma. But the cricket fans got stuck on this one person who was standing in the very first row next to captain Kohli. She was none other than Kohli's wife and bollywood actress Anushka Sharma. In the picture, from Indian skipper Virat Kohli to head coach Ravi Shastri, all the men are seen dressed in matcIndia Vs England, Statistical Preview: India's spin duo Ashwin and Jadeja will look to reverse fortunes at Lord'shing, classy clothes. Twitterati slams BCCI and raised the question how she was the only partner/spouse present on the occasion?